Publication Data: 1st edition from St. Martin’s Press, 1984; this paperback edition 1985 from PaperJacks, Canada. ISBN 0312832788 in hardcover, 0770103340 in paperback. 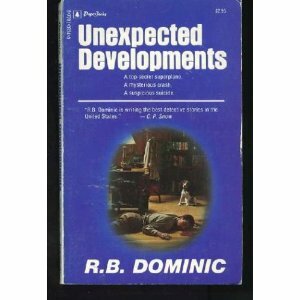 R. B. Dominic, of course, is a pen name for the writing duo known more commonly as Emma Lathen. This is an entry in a short series they wrote (and seem to have abandoned) about Representative Ben Safford, an American politician from a small town who constantly gets involved in murders. I enjoy Emma Lathen, especially the earlier entries in her series, and if you like this style you will definitely like R. B. Dominic. This one is set against the background of a young Air Force pilot who has been railroaded through a verdict of “pilot error” in connection with the crash of an experimental plane developed by a huge corporation with a web of patronage and graft. Ben Safford is inveigled into taking a hand to see that justice is done for the pilot, who lives in the area he represents, and soon finds himself in the middle of a turmoil that includes the Pentagon, the Saudi Arabian Embassy, Congress, the newly-minted Ambassador to France and his wife, and a beautiful redhead who happens to be a flight instructor for the Air Force. Dominic/Lathen is at her/their best when giving you the “backstage” look at large-scale social institutions. The Dominic books are about politics just as the Lathen books are about big business, but there is frequently an overlap. Dominic has the knack of making you think (a) that you understand the way that politics works, because she definitely does, and that (b) you are sufficiently sophisticated to understand and accept the “underside of the rock”, the way that bribery and corruption and pressure tactics and out-and-out dishonesty are endemic in American politics. All this is accomplished in a fairly bloodless way, in almost a cozy style. Even when a corrupt politician in the pocket of the airplane company is blown up by a bomb in his briefcase, it’s offstage; we don’t see blood or guts, just the reactions of witnesses. Economical writing, nothing specific — but you so completely get the idea. Hell, I can almost see her. The Dominic books are filled with little moments of wicked but gentle humour. Notes for the Collector: I note that I paid $2.50 for an old paperback copy of this; I further note that the paperbacks are quite scarce since they were published in a small edition by a relatively obscure Canadian house, PaperJacks. You may find the price I noted today on Amazon, $45.05 for the used paperback, to be as astonishingly overpriced as I did. (It starts at $7.50 in paper on abebooks.com, which is still quite pricey; later editions of the Canadian paperback have a “Sale price $1.99” bullet superimposed on the cover plate, which will anger the canny reader.) A reading copy of the hardcover first edition, ex-library, starts at $3 at Amazon and a nice clean copy is $24. It seems as though the variant title, “A Flaw in the System”, comes from a UK edition from Macmillan from 1983 but I was unable to conclusively confirm this. Apparently Dominic mysteries are more scarce than I had thought. This entry was posted in Detective fiction, Mystery, Novel and tagged Ben Safford, Emma Lathen, puzzle mystery, R. B. Dominic.